Quex House was built as a Regency gentleman's country residence and grew to become the Victorian mansion we see today. Still home to the Powell-Cotton family, it has a mellow atmosphere, many of the rooms appearing much as they did during Major Powell-Cotton's lifetime and complemented by flowers from the walled gardens at Quex. There are some splendid pieces of oriental and period furniture, fine rugs and porcelain as well as family portraits and an extensive collection of silver, clocks and memorabilia. The Park, gardens and woodlands provide an attractive and tranquil backdrop to Quex House and the Powell-Cotton Museum. Surrounding the house are 250 acres of parkland and gardens - the very essence of an English garden with its meandering paths and the heady scent of old roses. Over the last few years much work has been done to return the gardens to their Victorian splendour. The walled and pleasure gardens are now fully open to the public and can only add to the visitor's enjoyment of this unique attraction. The polished mahogany cases displaying Major Powell-Cotton's treasures give Quex Museum its authentic quality, so often lacking in modern visitor attractions. There are eight galleries in all - three of them built by the Major himself - containing an amazing variety of items from the animal dioramas to striking tribal art, weapons, carvings and costumes as well as valuable collections of European and Chinese porcelain and local archaeology. What began as one man's museum has been painstakingly cared for and added to by members of the Powell-Cotton family and now offers visitors an exciting insight into the discoveries of a great Victorian explorer. A vast collection of treasures gathered by Powell-Cotton and his family on twenty-eight expeditions has been assembled at Quex, making this an exciting place to visit and an important centre for academic study. The Quex Tearoom provides light refreshments - lunches and teas - throughout the week from 11.00 am until 4.30 pm during the summer season when the Museum is open. On Sundays throughout the year there is a full Carvery lunch. Booking is recommended for the highly popular Sunday Carvery. The Quex Museum Shop stocks gifts to suit all ages. There is a wide range of things for children to spend pocket money on. 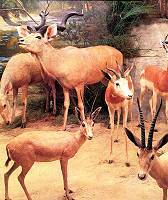 There is very good disabled access throughout the Museum, Gardens, Tearoom and the ground-floor rooms of Quex House. Two wheelchairs are available - please ask at the desk. For wheelchair users and those unable to use the stairs in Quex House a booklet describing and illustrating the upper rooms is available on request from the House Stewards who are a fount of information about the rooms and the history of the House. By Road: From London via M2, or from Canterbury via A28 and follow signs to Ramsgate International Ferry Port. Turn left at roundabout at Prospect Inn to Kent International Airport and follow signs to Birchington through Acol village. The entrance is on the right. By Rail: ½ hourly service from London Victoria to Birchington(approx. 1 ½ hrs). Taxis usually available at station. Quex is about 1 mile distant.